Derek Cianfrance of RadicalMedia directed this “Never stop. 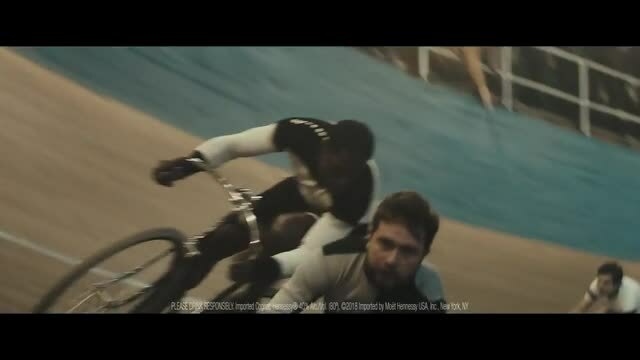 Never settle.” story of Marshall Major Taylor, the fastest man on two wheels for Hennessy out of agency Droga5 New York. At a time when an African American world champion of cycling was unheard of, Major Taylor was it. Hennessy’s new creative celebrates his perseverance through adversity and his rise to the top. The films depict Taylor as the greatest athlete of his day, a dominant champion whose search for rivalry pushed him deeper into competition with his own self. In this piece, that begins as an action-packed 1900s-era velodrome race which turns into a surreal, psychological race into the mind and soul of Taylor. Client Moët Hennessy Agency Droga5 NY David Droga, creative chairman; Duncan Marshall, creative partner; Alexander Nowak, executive creative director; Phil Hadad, sr. copywriter; Marybeth Ledesma, sr. art director; Rich Greco, group design director; Alison Lee, Andrew Diemer, jr. designers; Chloe Karayiannis, jr. technologist; Jonny Bauer, global chief strategy officer; Ramon Jimenez, group strategy director; Ben Brown, strategy director; Midori McSwain, strategists; Sally-Ann Dale, chief creation officer; Jesse Brihn, Bryan Litman, co-directors of film production; Ruben Mercadal, associate director of film production; Sasha Pace, associate producer; Mike Ladman, Jonathan Hecht, music supervisors; Justin Durazzo, co-director of interactive production; Alyssa Cashman, producer, interactive; Cliff Lewis, director of art production; Bianca Escobar, associate director, art production; Frannie Schultz, producer, art. Production RadicalMedia Derek Cianfrance, director; Roman Vasyanov, DP; Jim Bouvet, exec producer; Tommy Turtle, producer; Ged Clarke, production designer; Zelda Sellars, costume designer; Dennis Sonin, 1st AD; Mariko Atamenko, 2nd AD. Editorial The Quarry/Wax Paul Watts, editor; Drew Balke, lead assistant editor; Audrey Weiner, Jim Robinson, additional assistant editors; Toni Lipari, exec producer (Wax); Tor Adams, exec producer (The Quarry). Postproduction The Mill Melanie Wickham, exec producer; Freya Hewitt, sr. producer; Mia Lalanne, production coordinator; Gavin Wellsman, David Fleet, shoot supervisors/creative director; Christoph Schroer, 2D lead artist; Jasper Kidd, 3D lead artist. Telecine Company 3 Tom Poole, sr. colorist; Jenny Montgomery, assistant colorist; Alexandra Lubrano, producer. Music Woodwork Music Philip Kay, composer; Andy Oskwarek, Sam Phillips, producers. Sound Design Q Department Audio Post Sonic Union David Papa, mixer. Marshall “Major” Taylor Estate Research Nickerson Research Susan Nickerson, Chris Lutz.